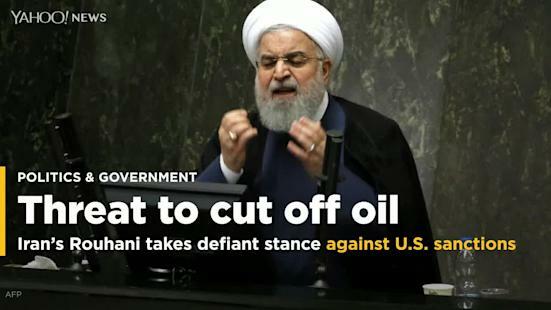 AFP• December 4, 2018 Tehran (AFP) – Iran’s President Hassan Rouhani struck a defiant stance against US sanctions on Tuesday, renewing his threat to cut off international oil sales from the Gulf. „America should know… it is not capable of preventing the export of Iran’s oil,“ Rouhani said at a televised rally in Semnan province. „If it ever tries to do so… no oil will be exported from the Persian Gulf,“ he added. It has vowed to reduce Iran’s oil sales to zero, but has granted temporary waivers to eight countries. The president downplayed the economic impact of sanctions, accusing the media of exaggerating the country’s problems. „No hyperinflation, no massive unemployment will threaten us. People should stop saying such things in the papers,“ he told the crowd. The latest inflation report from Iran’s central bank says food prices rose 56 percent year-on-year in October. Rouhani acknowledged there were „some problems“, but said these would be addressed in the new budget plan to be presented on December 16. One of the key treaties that helped to end the Cold War and reduce nuclear tensions between the U.S. and the Soviet Union and now Russia could be dead within a matter of months. Secretary of State Mike Pompeo announced at NATO Headquarters Tuesday that the U.S. will suspend its obligations under the Intermediate-Range Nuclear Forces treaty in 60 days because of Russia’s continued violations of the treaty, shortly after NATO’s foreign ministers affirmed its support for that conclusion in a new joint statement. President Trump and National Security Adviser John Bolton had previously suggested the U.S. would withdraw from the treaty, but Pompeo’s announcement Tuesday officially starts the clock. The decision comes as the U.S. seeks to counter a „larger pattern of Russian lawlessness on the world stage,“ according to Pompeo, but also to take on China’s growing military power, with the top U.S. diplomat warning the treaty gives China a military advantage. But to some arms control experts and Democrats in Congress, the decision was a hasty one that will make the world less safe. The U.S. will remain in compliance for the next 60 days and then begin the six-month notice period before withdrawal, he said, adding that if Russia comes back into compliance before then, the U.S. could remain in the agreement. Pompeo said there is „complete unity“ among NATO members on this decision, and it comes after the Foreign Ministers of NATO released a joint statement that says Russia’s development and deployment specifically of the 9M729 missile system „poses significant risks to Euro-Atlantic security“ and „is in material breach of its obligations under the INF Treaty,“ paving the way for U.S. withdrawal. The U.S. has remained in compliance of the treaty, the group added, despite claims by Russia to the contrary. Russia has denied violating the INF treaty, at first denying the existence of the weapons system and then later admitting it existed but arguing it was in compliance. President Donald Trump and Russia’s President Vladimir Putin arrive for a meeting at Finland’s Presidential Palace on July 16, 2018 in Helsinki. Russia’s violations of the landmark nuclear treaty are also part of a „larger pattern of Russian lawlessness on the world stage,“ Pompeo added, citing its invasions of Georgia and Ukraine, its intervention in Syria in support of the Assad regime, its election interference in the U.S. and other countries, its use of a nerve agent against an ex-spy in the U.K., and most recently its seizure of Ukrainian ships and sailors in international waters. But Pompeo did give other reasons for U.S. withdrawal, including the fact that China is not a party to the treaty and is beefing up its military capabilities. Russian President Vladimir Putin, left, and U.S. National security adviser John Bolton shake hands during their meeting in the Kremlin in Moscow, Oct. 23, 2018. „Measures were looked at for increasing the military capabilities of troops and forces in the conditions of an arms race, connected with the plans of the U.S. to withdraw from the Intermediate-range Nuclear Forces treaty,“ Shoigu said, according to Russian-state media. It’s that concern that upset Congressional Democrats, blasting the administration’s decision as a dangerous move that „play[s] directly into President Putin’s plans,“ according to Rep. Adam Smith, the incoming Democratic chair of the House Armed Services Committee. „The Trump administration should instead work with our allies to take meaningful actions to hold Russia accountable for its violation of the treaty, press Russia back into compliance, and avoid a new arms race,“ said Smith, D-Washington, in a statement. ABC News’s Patrick Reevell contributed to this report from Moscow. TEHRAN, Dec. 04 (MNA) – Iran’s Deputy Foreign Minister for Political Affairs Abbas Araghchi met and held talks with senior Pakistani officials during his visit to Islamabad on Monday. Visiting Islamabad to attend the 10th round of the Pakistan-Iran Bilateral Political Consultations, Araghchi held separate talks on Monday with Pakistan’s Foreign Minister Shah Mahmood Qureshi, Foreign Secretary Tehmina Janjua, and Chairman of Pakistan Senate’s Foreign Relations Committee Mushahid Hussain. During the talks, both sides stressed the importance of promoting bilateral ties anchored in religious and socio-cultural affinities, and exchanged views on other important regional and international issues including the situation following the US’ unilateral withdrawal Iran’s nuclear deal, the situation of human rights in Kashmir, and the conflict in the Middle East countries. In particular, measures to enhance bilateral trade to achieve the annual target of USD 5 billion through facilitation of business communities, scaling down of trade barriers and speedy progress on facilitating preferential trade were discussed in detail. The two sides also agreed on the need to further improve railway connectivity between the two countries. The Pakistan-Iran Bilateral Political Consultations are one of the several important institutional mechanisms to regularly review and chart the way forward in various areas of cooperation. The meetings are aimed at providing the opportunity to review the progress made under various mechanisms concerning consular, economic, trade and border related issues between the two sides.